After reaching the semi-final of the UK Championship, won the Scottish Open and again reaching the semi-final of the Masters, Marco Fu has made unexpectedly early exits from the German Masters and the China Open in recent weeks. 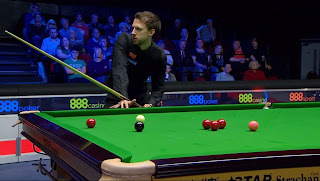 However, the vagaries of the one-year ranking list mean that the first three in the betting for the World Grand Prix, Ronnie O’Sullivan, Mark Selby and Judd Trump, are all in the top half of the draw, so there may be some value to be found by backing the Hong Kong player to win outright at 18/1 with Sporting Bet. It’s not difficult to envisage Fu, seeded 6, beating Jamie Jones in his opening match, or the winner of David Gilbert/Anthony McGill in the second round and, by then, the draw could look even more attractive depending on what happens elsewhere. In any case, the 39-year-old avoids John Higgins until the quarter finals and Shaun Murphy or Ding Junhui until the semi-finals, so looks overpriced regardless of what happens in the top half of the draw.